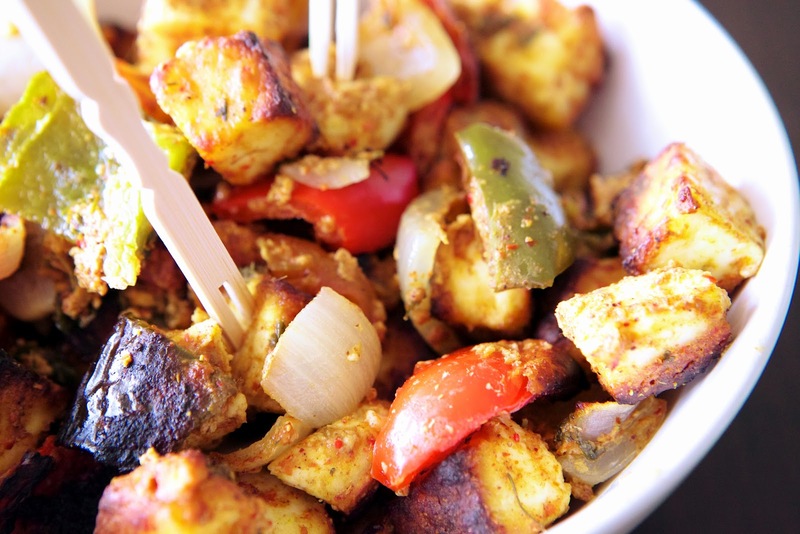 Who doesn't love paneer, the fresh Indian dish? It's not the healthiest thing in the world but is so versatile and delicious. I love it in all kinds of incarnations, such as palak paneer (which was a hit at this month's Mango Ginger-Mistress of Spices Supper Club), paneer butter masala and shahi paneer as well in my favorite chili paneer samosas. Paneer is also great in tandoori-style preparations, the tandoor being a traditional Indian clay oven which imparts a rich, smoky flavor to food. Paneer tikka cooked tandoori-style is a beloved starter or main dish in Indian restaurants the world over, and so I just had to make this delicious version by Puja of US Masala, one of my favorite Indian food blogs. Like everything on Puja's site, it was a hit! Chunks of paneer, bell peppers, tomato and onion marinated in a spicy yogurt sauce and then roasted in a very hot oven. Simple as can be, but scrumptiously delicious! I made no changes to Puja's recipe other than not roasting the paneer and vegetables on skewers (I rather just placed everything on a foil-lined baking sheet and turned over halfway during the cooking process). Our house smelled so amazing while this was in the oven...we just couldn't wait until it was done to dig in! We enjoyed this with some sweet mango chutney and pickled onions...Puja suggests lemon wedges, onion slices and chaat masala. Try her recipe...you'll love it! The paneer monster has arrived! This looks delicious. A must try! Really happy to see you got a chance to try my recipe and even better that you guys liked it so much. The kinds words are really appreciated and thank you for the link back as well.